Still smarting over a recent confrontation? Your moment of weakness actually came across as a show of strength as you’ll see for yourself today. 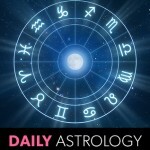 You were feeling so conflicted that you wanted to call it quits, but lunar aspects involving Jupiter and Pluto will make you feel more centered. Respond to a compromise with a compromise. There can be no single winner, but you both benefit by working together. A sudden impulse to organize your desk or rearrange the furniture leads to a surprising discovery. Meeting with someone you’ve been on the outs with does more than clear the air. It revives a friendship that you’ve both been missing. You’ll be risking someone’s displeasure, but it’s in service to a good cause. Score that moral victory and then let it speak for itself. Sometimes non-verbal communication is the best way to communicate. People can feel what you feel today and you’ll see them respond in kind. Good news from far away brightens your day. This does more than bring a smile to your face. It could change the way you live. Others see the way ahead better than you, so trust in their guidance. Even unflattering criticisms carry helpful insights. Preparing for a rainy day has gotten in the way of enjoying the sunny ones. Leave the galoshes behind and let yourself live a little. You’re managing the emotional pressure quite well. Today’s Moon/Jupiter trine shows you acclimating to what could have been a crushing situation. Good feelings of generosity and benevolence return today thanks to the Jupiter/Moon trine. This lifts the cloud of despondency and gets pent-up emotional energy circulating again.